Cape Town, South Africa had been on my travel bucket list for as long as I could remember. It's one of those destinations that seemed to encompass anything and everything one could want: gorgeous beaches, a large city, interesting culture, adventure, and countless attractions to lure in both the seasoned traveller and the less-experienced tourist. So, last summer I finally booked travel arrangements, packed my luggage, and boarded a sixteen hour flight. I arrived in Cape Town exhilarated, everything I had heard about the city left me with a lofty sense of anticipation. A part of me knew, my expectations were probably too high. However, after the plane landed, I set out to make the most of this coveted location. My favorite part of Cape Town was Muizenberg Beach, where I spent most of my days surfing beside Muizenberg Mountain. 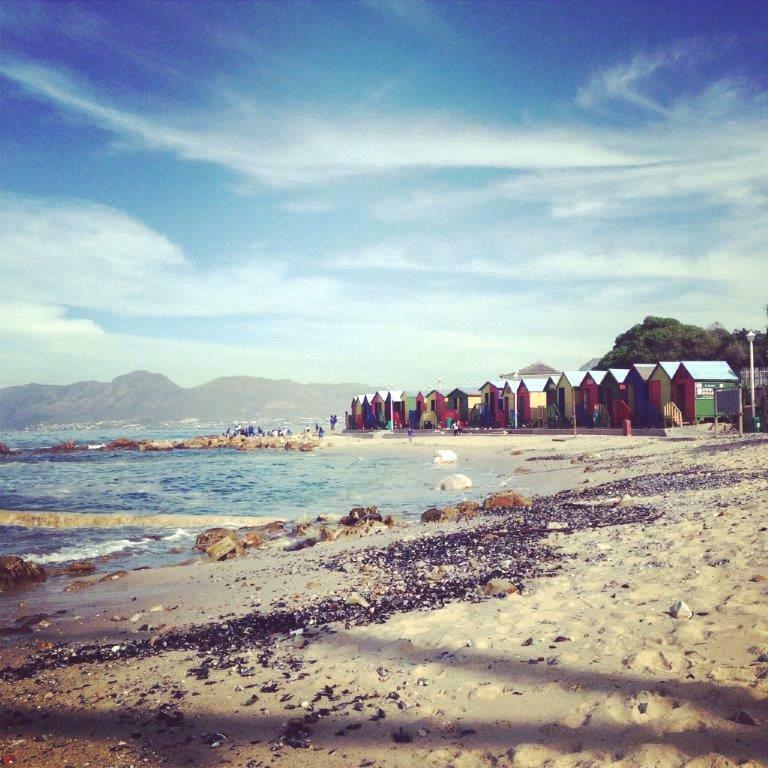 Muizenberg is approximately forty minutes from Cape Town by train and definitely worth a visit. If you are into surfing— you won't find a better spot, and if you're more of a land lover, the view isn't quickly forgotten. At Muizenberg Beach there’s a concrete path which snakes beside the sea, and it's just a short walk to St. James Beach that boasts a line of beach huts with lively hues sitting beside the shore, a site that has become an iconic representation of South Africa. If you're looking for shopping, Kalk Bay, located one stop from St. James on the train, is a lovely area packed full of boutique stores. If you do happen to stop by to browse the shops, I'd recommend hitting Kalky's Fish and Chips for a casual meal. It's a small restaurant with great fish and chips located on Kalk Bay harbour. In the afternoon you may even catch a glimpse of some giant sea lions hanging around after lunch, waiting for scraps from the fish market. Another delightful day trip is Simon's Town, a quaint town where the South African Navy resides, populated with many touristy gift shops full of postcards, key chains, and trinkets with semblances of South Africa. Simon’s Town is also well-known because of Boulders Beach, a calm stretch of ocean dotted with boulders of granite that a colony of African penguins call home. However Boulders Beach certainly is not an all-day affair, so I also suggest an airboat ride to Seal Island while you are in the area. We went with Simon's Town Boat Company (which leaves from Simon's Town pier) and the ride out to the island is still one of my most cherished travel adventures of all time. The water was glassy, the views were majestic, and when we finally arrived at the island, we were surrounded by seals playfully darting through the water, beneath our boat, and beside us. Of course, there’s still the city of Cape Town. The city itself is an eclectic mix of African and European culture. 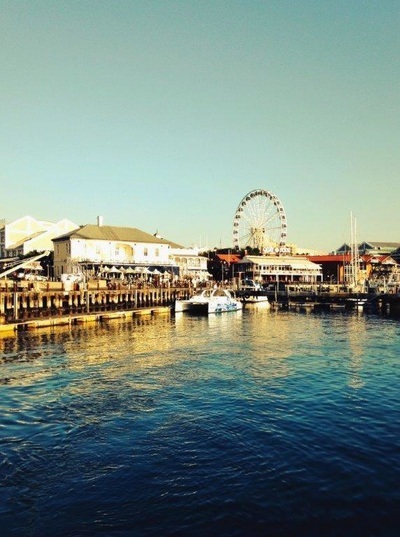 You can shop at high end stores located on the waterfront or head to Greenmarket Square, an African market set in the heart of Cape Town's business district. The vendors set up outdoors in a small square surrounded by coffee shops and restaurants. I bought three pairs of cotton pants, a cloth purse made of brightly colored fabric, two soapstone bowls, original paintings of South African wildlife on thick pieces of unframed canvas, and numerous pieces of handmade jewelry. Greenmarket Square has an authentic feel and bargaining for a fair price is not only accepted but expected. Another place not to miss in the city is The V&A Market on the Wharf, located near Nobel Square on Dock Road. In this large brick building nestled beside the water, you can find mouthwatering cuisine from all over the world. Sample American corndogs, gourmet samosas, artisanal cheeses, fresh seafood from the Western Cape, Argentine empanadas, Hydrebhad lamb biryani, Belgian waffles, Bavarian bread, Mozambique prawns, Tunisian shawarma, or Turkish bagels, amongst many other diverse options. The atmosphere is laidback, the vendors are friendly, and there is ample seating both indoors and upstairs. Go hungry and enjoy. From Cape Town you can also catch a boat across Table Bay to Robben Island. You'll need to purchase tickets for Robben Island Museum in advance, and after a scenic trip across the water you can tour the former maximum security prison by bus. Not only do you have the opportunity to see President Nelson Mandela's prison cell and learn much more about the political history of South Africa, but the tour guides are all former prisoners. Therefore, this tour offers a unique and rare perspective on the actualities of life as a prisoner and the circumstances under which they were held. For any history or politics buff, this tour is a must. One of Cape Town’s most famous landmarks, Table Mountain, is easily accessible by taking a cab from the city center. It’s approximately a fifteen minute drive down the M62 highway and if you don’t want to climb, simply take a cable car up to the top. The day we explored the large plateau was overcast, so we occasionally found ourselves engulfed in clouds. If you go in the winter, be sure to dress warmly—my teeth were chattering by the end— but it was absolutely worth the panoramic view of the water and the city from atop one of the natural wonders of the world. Visiting Cape Town was a lot like standing on Table Mountain, the wind blowing through my hair, clouds lingering at eye level, surrounded by epic views in every direction. There was something about the place— the rugged natural beauty, the rich culture, and the endless array of places to explore—that made me feel like I was on top of the world. Although I arrived in South Africa with high expectations, my biggest disappointment was not being able to stay longer. I’m not usually a repeat destination traveller, but Cape Town is a place to which I am certain I will return.